Are those fishing lines?....LOL. 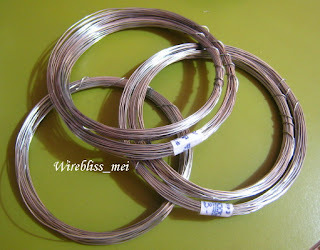 Stainless steel fishing lines! Wonder what type of fish I will catch with them? Actually, those are my spools of stainless steel wire of different gauges. That is how I keep my wire for now. There were only 3 spools at first but now I have nine. That will last me for a while. These colorful plastic spools are from the tackle shop. The wires that I bought came in individual loose coil as shown in the second picture here. Took me few hours to coil them all. The green spool at the top has about 70 yards of 19g wire on it. That'll give you some idea how much I can do with them. A lot I hope.